One year ago today, I had just arrived home from an epic 15 day tour of Italy. We visited 9 cities (18 if you count the 5 little towns we visited along the Amalfi Coast and the 5 individual towns comprising Cinque Terre). Every day my phone sends me my photo memories and, needless to say, I’ve spent these last two weeks wishing more than ever that I was heading back! It’s all my wishful thinking that has brought about this post commemorating our trip. Here is a round-up of some of my favorite photos to show you what it’s like to spend 2 in weeks in Italy. Venice is dreamy and full of surprises at every turn. One day in Venice is hardly enough to soak in the beauty and history of this unique city, but I am so glad it was part of our 2 weeks in Italy. The ultimate tourist trap! I loved our gondola ride. Ah, Rome. Rome is rich in history and full of hidden gems. Tourists flock to this city for it’s ancient monuments and to, of course, pay a visit to the Vatican. If you’re building an itinerary for two weeks in Italy, three days in Rome is enough time to cross the major items off or your bucket list. However, it’s easily worth an entire two weeks on its own! If you love history & architecture, extend your time here. The things you can do to immerse yourself into Rome’s history and culture are endless. If you need a moment away from the crowds, explore one of Rome’s beautiful neighborhoods such as the Trastevere. View of the Pantheon from our hotel room. Don’t forget to throw a coin in the Trevi Fountain! Bernini’s Fountains in Piazza Navona. There is an amazing gelato shop called Tre Scalini here… you can see the storefront in the distance (right of photo). The dome of St. Peter’s from inside Vatican City. Front view of St. Peter’s… You can hardly tell there are about a zillion tourists up there! View of the ruins from Palatine Hill. Everything is SO SO BIG! Inside San Pietro in Vincoli (Rome). On day six, we continued our journey south. First, a stop at the Mt. Vesuvius National Park to hike the famous volcano and then a stop to marvel at the remains of the city it destroyed in 79 A.D. Be sure to wear appropriate shoes and have plenty of water on hand for both of these activities! Hiking Vesuvius is not too difficult for most to enjoy but it’s no walk in the park either. If you’re up for some physical activity, the reward is well worth it. Pompeii, while easy to explore, is much more vast than many people realize. Plan to spend at least three hours in Pompeii. If you prefer an easier day, plan to spend half a day to a full day exploring the ruins. Both of these places are easy day trips from Rome, Naples or Sorrento. After a full day of exploring Vesuvius and Pompeii, we finally arrived at the beautiful coastal city of Sorrento. Sorrento is an excellent city to base yourself for a visit to the Amalfi Coast and Capri. The smaller towns along the Amalfi coastline are more difficult to access with steep and narrow passageways. From Sorrento, you can hire a driver or skipper to safely take you anywhere you’d like to go. Alternatives are guided tours by bus or, of course, self-guided if you’re up to the challenge! We chose to hire a driver for a very reasonable cost to make the drive along the Amalfi coast. We absolutely loved this experience. Our driver was amazing, attentive and personable. If you’d like this experience, Aldo Limos provides quality service for a very fair price. View from our hike up Mt. Vesuvius. Another view on our hike. Why? Because the view over Naples was AMAZING! A look inside the volcano. Looking back at Mt. Vesuvius from our next stop… Pompeii. Mt. Vesuvius from the rooftop of our hotel. Isle of Capri. View from Sorrento. Hanging out on some beach on the way to Amalfi. Photo creds to our skipper! I love that he took liberty of using my camera to capture moments like this. Checking out the grottos of Capri. View of Positano from the boat. We traveled many places in Italy over the course of 2 weeks but I think Florence was my favorite. When I imagined Italy, I must have been imagining Florence. Beauty, wine, the smell of leather, the aromas from Tuscan kitchens; it all collides to form a work of art as beautiful as the many you will find within this city. If. you’re visiting Florence with kids, be sure to take a ride at the Antique carousel in Piazza Della Repubblica! Our last activity? The last supper! We did a LOT! I’m still amazed at how much yet how little you can actually see and do in 15 days. We managed to visit all of the main tourist sites (we’re suckers) and also get a taste of life like a local. What I do know is that we couldn’t have done it without a plan. Coming soon to the blog will be our full itinerary covering our entire 2 weeks in Italy but in the meantime, you can check out our Venice Itinerary and Rome Itinerary! Don’t forget these MUST-HAVES for your trip to Italy. Beautiful photos! I spent a week in Rome and visited the Vatican. It truly is an amazing experience. The history it tells is phenomenal. I would have loved to visit Pompeii like you did! How awesome! Amazing pictures, I’m been a little homesick. Such lovely pictures! Italy is on my travel bucket list! Beautiful photos! Venice is one of my favorite places in the whole world. Hoping to go back to Italy next year and see more of the Amalfi Coast and the Cinque Terre! I love this! I went to Italy in 2013 (1 night in Florence and 4 nights in Rome) and I miss it! Would love to go to Amalfi coast too! Your pictures are incredible! That must have been quite an amazing experience! I went to Rome last December and explored the city with my brother for a few days, but I would have loved to travel across the rest of Italy! Italy is so beautiful! You’re photos make me want to go back! Amazing pictures Jenna! Italy is on my travel bucket list with the kiddos so I can’t wait to see some of these sites in person! These are some great pictures! It’s been almost 10 years since I visited Italy. To this day, the best travel related advice I have ever received was to arrive at the Vatican before it opens in order to avoid the crowds. There were only a handful of people in front of us when we lined up and when we left after taking it all in, the line was endless. I look forward to seeing more posts about this trip! Beautiful! 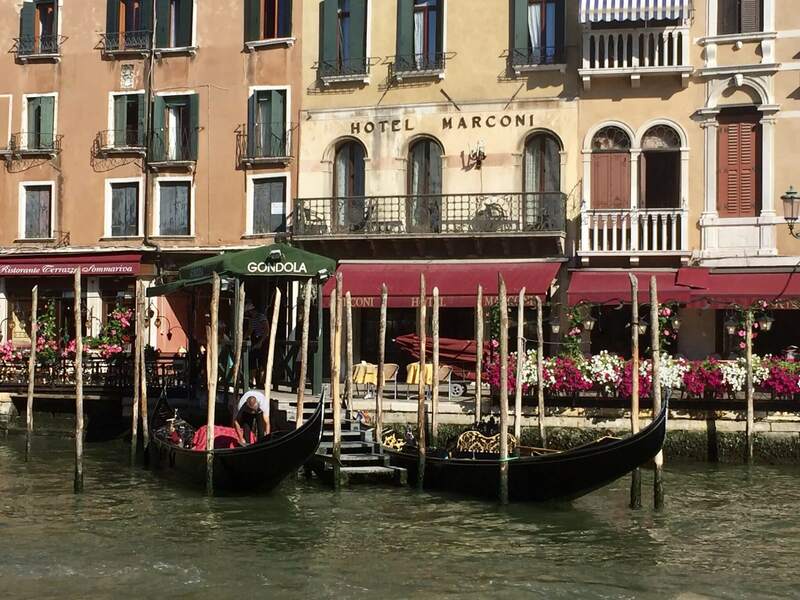 We went to Rome, Florence, Sorrento, and Capri- but we didn’t make it to Venice! Definitely on my bucket list! Your photos are beautiful, Italy would be so much fun to visit!